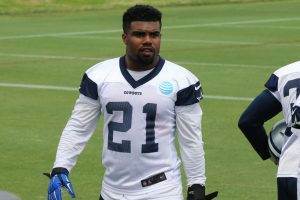 Ezekiel “Zeke” Elliott was born on July 22, 1995 in Alton, Illinois. Ezekiel Elliott is an NFL running back for the Dallas Cowboys and was drafted in the first round of the 2016 NFL Draft. He played collegiately at Ohio State University where he earned All-American honors in 2015. Ezekiel Elliott attended high school at John Burroughs School in Ladue, Missouri. Even though John Burroughs School was known more for their academics, Elliott was a standout player in several sports, including football, baseball, track, and basketball. Ezekiel Elliott was a standout track and field athlete and was a state qualifier in different sprinting and hurtling events. He won four state championships at the Missouri Class 3 state championships and was amazingly able to accomplish this in just 2 ½ hours. He recorded his career best times in the 100-meter dash (10.95 seconds), the 200-meter dash (22.05 seconds), 110-meter high hurdles (13.77 seconds), and the 300-meter hurdles (37.52 seconds). He was named the Gatorade Track Athlete of the Year in the state of Missouri because of his accomplishments. Elliott played running back for the John Burroughs Bombers football team, and as a junior in 2012 was named the St. Louis Post-Dispatch Offensive Player of the Year after rushing for 1,802 yards and scoring 34 touchdowns. He also caught 23 passes for 401 receiving yards and scored six touchdowns. In his senior year, Ezekiel Elliott accumulated 3,061 all-purpose yards and 50 total touchdowns, including 2,155 rushing yards and 40 rushing touchdowns. 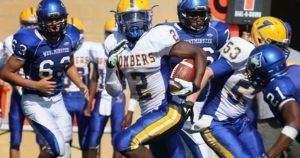 In his high school career he led the Bombers to three straight title games, but they lost all three. He also played in the U.S. Army All-American game and became the unofficial poster boy for the event. Ezekiel Elliott was considered a four-star recruit by Rivals.com coming out of high school and was listed as the #9 running back in the nation in 2013. 247Sports.com had Elliott rated as the fourth best running back. Despite the fact that both of his parents were student athletes and attended the University of Missouri, Ezekiel Elliott decided to become an Ohio State Buckeye. As a true freshman in 2013, Ezekiel Elliott saw action 11 games playing behind future second round draft pick and Big Ten Running Back of the Year, Carlos Hyde. He carried the ball 30 times for 262 rushing yards. He also averaged 8.7 yards per carry and scored two touchdowns. 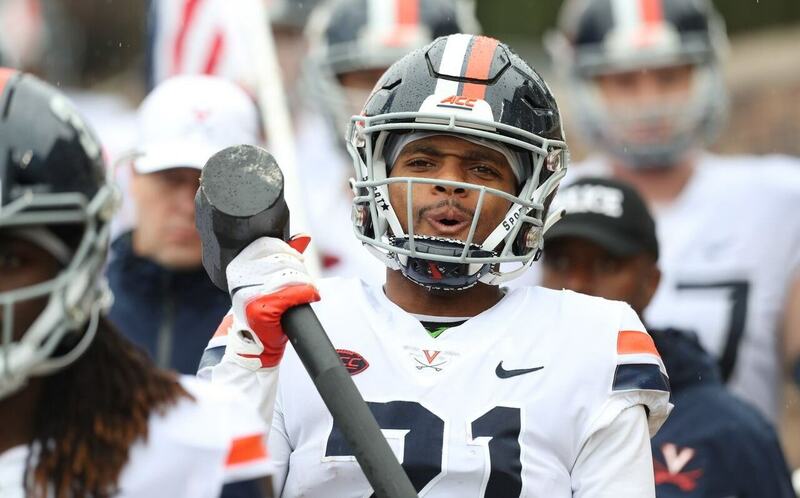 Elliott became the starter as a sophomore in 2014 and ran for 1,878 yards on 273 rushing attempts. Elliott’s 1,878 rushing yards was second-most in school history, second only to Eddie George’s 1,927 rushing yards back in 1995. Ezekiel Elliott also had 28 receptions for 228 receiving yards. 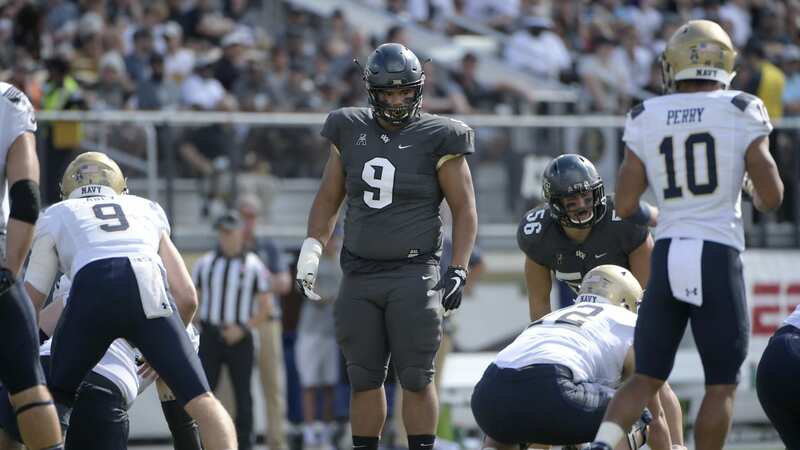 He won the James E Sullivan Award, Archie Griffin Award, and was named to the Academic All-Big Ten Conference team. Ezekiel Elliott became only the third Buckeye to top 2,000 all-purpose yards in a season. As a junior in 2015, Elliott rushed for 1,821 yards and scored 23 touchdowns on just 289 rushing attempts. He also added 27 receptions for 206 receiving yards. He ended up finishing eighth in the Heisman Trophy voting, but won plenty of other awards. Ezekiel Elliott finished his career at Ohio State second in career rushing yards, behind Archie Griffin (5,589) and ahead of Eddie George (3,768), with 3,961 rushing yards. He will be remembered as one of the best running backs in Ohio State history. Ezekiel Elliott didn’t have to wait long to hear his name announced in the 2016 NFL Draft. The Dallas Cowboys held the 4th overall draft pick and didn’t hesitate to write his name down on the draft card. The running back position has been devalued somewhat over the past several years, but Elliott’s production in college and the fact that there really aren’t any holes in his game makes him a surefire day one starter for the Dallas Cowboys. The Cowboys could have decided to go defense in the first round, but the the pairing of Ezekiel Elliott with the Cowboys’ young and dominant offensive line was too much of a temptation to pass up. Ezekiel Elliott was the highest drafted running back since Trent Richardson, when he was drafted third overall by the Cleveland Browns in the 2012 NFL Draft. Ezekiel Elliott’s professional career has yet to kick off, but there are a lot of high hopes from fans and people within the Cowboys organization who believe that big things are ahead of him in the NFL. 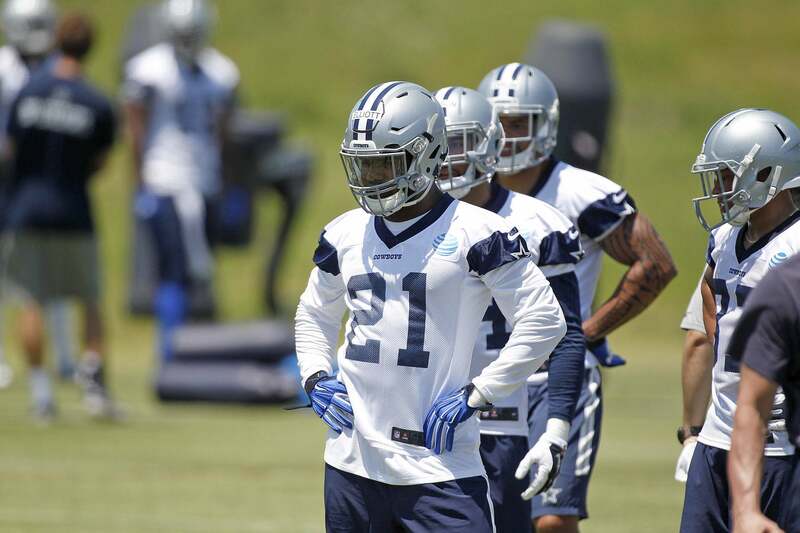 Elliott is already the “unofficial” favorite to win Rookie of the Year and a lot of that can be attributed to not only his talents as a running back, but the fact that he will be running behind the Cowboys’ dominant offensive line. Predictions aside, Ezekiel Elliott is one of the best all-around running backs to enter the NFL since Adrian Peterson, and there are a lot of high expectations being placed on his arrival in Dallas. Ezekiel Elliott signed a four-year contract with the Dallas Cowboys worth $24,956,338 and will make an average of $6,239,085 per season, which makes him the ninth highest paid running back out of 200 running backs in the NFL. Elliott also received a $16.35 million signing bonus. 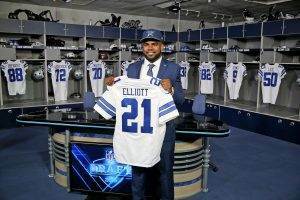 Elliott’s base salary as a rookie in 2016 will be $450,000 and his cap number will be $4,537,516. In 2017, his base salary will be $1,584,379 and his cap number will be $5,671,895. His 2018 base salary will be $2,718,758 and his cap number will be $2,806,274. In his final year of his rookie contract his base salary will be $3,853,137 and his cap number will be $7,940,653. 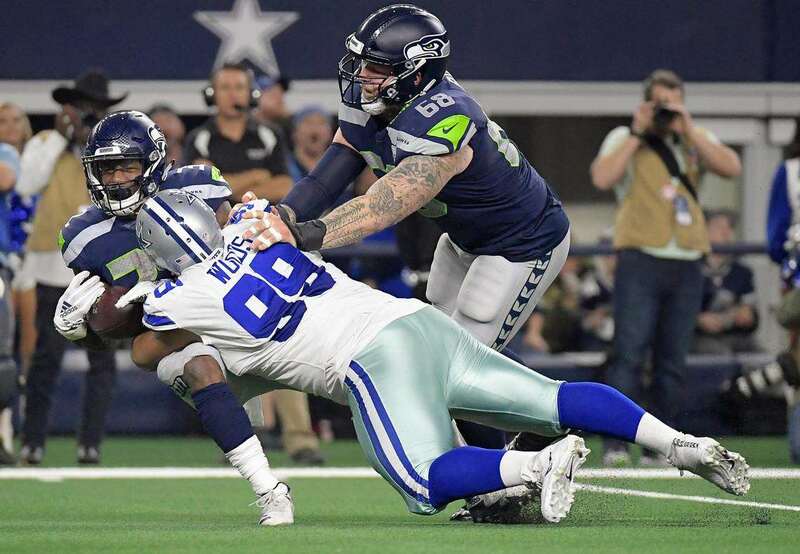 The Dallas Cowboys will then have to decide whether they want to pick up his fifth year option or offer him a long-term contract.